LOS ANGELES -- Actor-comedian Alan Young, who played the amiable straight man to a talking horse in the 1960s sitcom "Mister Ed," has died, a spokeswoman for the Motion Picture and Television Home said Friday. He was 96. The English-born, Canadian-educated Young died Thursday, according to Jaime Larkin, spokeswoman for the retirement community where Young had lived for four years. His children were with him when he died peacefully of natural causes, she said. Young was already a well-known radio and TV comedian, having starred in his own Emmy-winning variety show, when "Mister Ed" was being readied at comedian George Burns' production company. Burns is said to have told his staff: "Get Alan Young. He looks like the kind of guy a horse would talk to." Mr. Ed was a golden Palomino who spoke only to his owner, Wilbur Post, played by Young. Fans enjoyed the horse's deep, droll voice ("WIL-bur-r-r-r-r") and the goofy theme song lyrics ("A horse is a horse, of course, of course ... "). Cowboy star Allan "Rocky" Lane supplied Mr. Ed's voice. An eclectic group of celebrities including Clint Eastwood, Mae West and baseball great Sandy Koufax made guest appearances on the show. 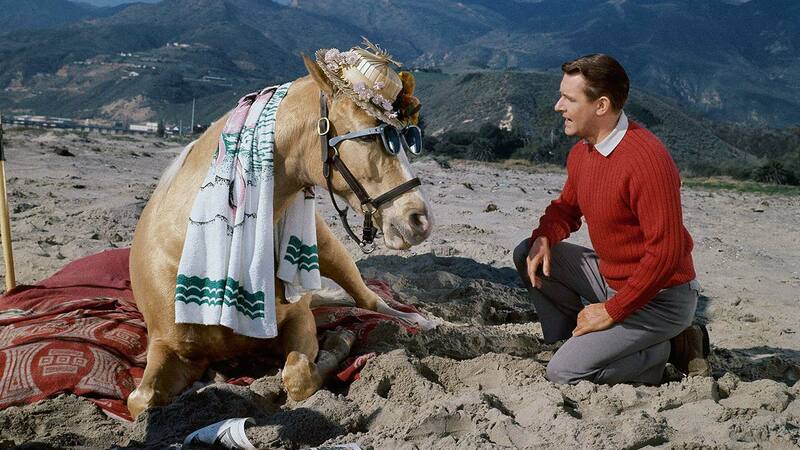 "Mister Ed" was one of a number of situation comedies during the early to mid-'60s that added elements of fantasy. Others were "My Mother the Car," in which a man's dead mother spoke to him through an old car; "My Favorite Martian" in which a Martian took up residence on Earth disguised as the uncle of an earthling; and "Bewitched" in which a witch married a mortal. A loose variation on the "Francis the Talking Mule" movies of the 1950s, "Mister Ed" was one of the few network series to begin in syndication. After six months, it moved to ABC in October 1961 and lasted four seasons. When the cameras weren't rolling, the human and four-legged co-stars were friends, according to Young. If Ed was reprimanded by his trainer, Young said, "He would come over to me, like, 'Look what he said to me.'" Like many series of its vintage, "Mister Ed" won new fans in later decades through near-constant cable TV syndication and video releases. Young also appeared in a number of films, including "Gentlemen Marry Brunettes," ''Tom Thumb," ''The Cat from Outer Space" and "The Time Machine," the latter the 1960 classic in which, speaking in a Scottish brogue, he played time traveler Rod Taylor's friend. Young had a small role in the 2002 "Time Machine" remake. In later years, Young found a new career writing for and voicing cartoons. He portrayed Scrooge McDuck in 65 episodes for Disney's TV series "Duck Tales" and did voice-overs for "The Great Mouse Detective." Young's sly, low-key style first attracted a wide U.S. audience in 1944 with "The Alan Young Show" on ABC radio. He also drew attention from Hollywood, but early films such as "Margie" and "Mr. Belvedere Goes to College" did poorly and in 1950 he turned to the growing new medium of TV and moved "The Alan Young Show" to the small screen, where it offered a contrast to the slapstick and old vaudeville of other variety shows. His gentle comedy caused TV Guide to hail him as "the Charlie Chaplin of television," and the fledgling Academy of Television Arts and Sciences awarded Emmys to Young as best actor and to the show as best variety series. Howard Hughes, who had seen Young on TV, hired him for the lead in a film version of "Androcles and the Lion," a comedy based on the George Bernard Shaw play. When it opened in theaters, however, nobody laughed, so Hughes withdrew the movie and shot two weeks of new sequences. "He put in girls with gauze and a real lion, and it became a blood-and-guts film," Young recalled in 1987. The family moved to Canada when he was a child, and he began entertaining in Vancouver when he was 13. He had his own radio program, "Stag Party," on the CBC network by the time he graduated from high school. After two years in the Canadian navy, he moved to New York City. Young was a Christian Scientist from his teen years. In the early 1970s, he left his career to work for the Mother Church in Boston. He spent three years establishing a film and broadcasting center, then toured the country for two years as a Christian Science lecturer. Disillusioned by the church bureaucracy, he returned to Hollywood in 1976. In 1940, Young married Mary Anne Grimes and they had a daughter, Alana, and a son, Alan Jr. The marriage ended in 1947. In 1948 he married singer Virginia McCurdy, and they had a son, Cameron Angus, and a daughter, Wendy. There was no information on survivors.